The following day [28 March, 1843] we proceeded farther, and passing through Wadi e’Scheikh, we reached the Wadi Firan this most precious jewel of the Peninsula, with its palms and groves of Tarfa on the banks of a lovely rushing stream, which, winding among shrubs and flowers, conducted us to the old convent mountain of the town of Pharan, the Firan of the present day. Everything that we had hitherto seen, and what we afterwards saw, was naked, stony, desert compared to this fertile oasis, abounding in wood and water. For the first time since we had left the Nile valley, we once more walked on soft black earth, obliged to defend ourselves with our arms from the overhanging leafy branches, and we heard singing birds warbling in the thick foliage. 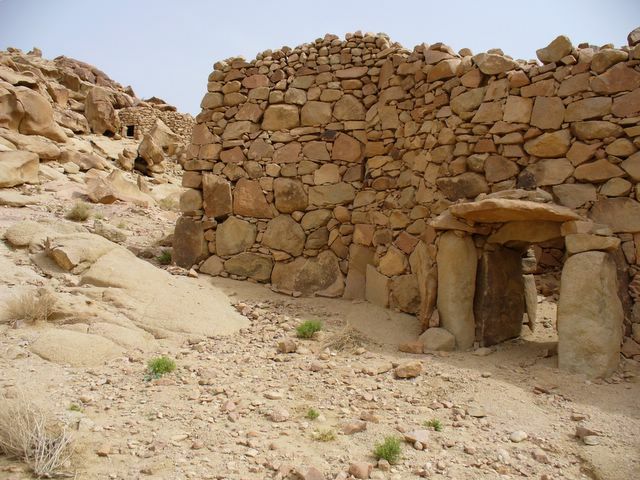 At the point where the broad Wadi Aleyat, descending from Serbal, enters Wadi Firan, and where the valley spreads out into a spacious level tract, there arises into the centre of it a rocky hill called Hererat, on the summit of which are the ruins of an ancient convent building. At its foot stood once a magnificent church, constructed of well-hewn rocks of sandstone, the ruins of which are built into the houses of the town situated on the slope of the opposite mountain. The same evening 1 went up Wadi Aleyat, passing innumerable rock inscriptions, to a well, surrounded by palm and Nebek trees, where I enjoyed the entire prospect of the majestic mountain chain. Apart from all the other mountains, and united into one single mass, Serbal rises, at first in a slope of moderate inclination, afterwards in steep precipices, with chasms, to the height of 6000 feet (above the sea). Nothing could equal the scene when the valleys and low mountains around were already veiled in the shadows of night, and the summits of the mountains still glowed above the colourless grey, like a fiery cloud in the sinking sun. In the same district is the Wady Mokkateb, or the Written Valley, so called for the number of rude inscriptions and sculptures with which the rocks are covered. They are not peculiar to this valley, but are found in many parts of the Sinaitic range. They always occur in the lines of route along which caravans or traders or bands of pilgrims are likely to have passed, and are inscribed in the soft sandstone rock which forms the fringe of the harder granite in the centre of the peninsula. The sculptures are grotesque representations of birds, camels, asses, hones, ibexes, and other animals. The inscriptions are sometimes in Greek, Latin, or Hebrew, but more commonly in a character unlike that of any known language.